A grouch through and through, but it was he who first taught me the value of memory, and how to think of it as mental music, a setting to iambs and trochees. We were all confused about what was happening; we were American, had always thought ourselves so, and not Japanese. It was I, no less solitary than he but having made the lesser use of the morning, who was to be pitied. But I was touched not only at the passage of these fixtures in my mental landscape, but also at the swiftness and dispassion with which the market swallowed even the most resilient enterprises. This was part of my suspicion that there was a mood in the society that pushed people more toward snap judgments and unexamined opinions, an antiscientific mood; to the old problem of mass innumeracy, it seemed to me, was being added a more general inability to assess evidence. Africa was always waiting, a substrate for the white man’s will, a backdrop for his activities. It was the art of a country that had an aristocracy but did not have the patronage of courts: a simple, open-faced, and awkward art. But atrocity is nothing new, not to humans, not to animals. We had to leave because the future was uncertain. We would have been targeted, that was almost certain, and who knows what else might have happened. It was only years later, when I became interested in these things for my own sake, that I surmised that my oma, heavily pregnant, had likely been one of the countless women raped by the men of the Red Army that year in Berlin, that so extensive and thorough was that particular atrocity, she could hardly have escaped it. Not that I liked labor for its own sake—far from it—but I found something true in the work, found something of myself in it. And the French are lazy, she said, they hate working and are envious of the Flemish. I’ll tell you this in case you don’t hear it from anyone else. Had Brussels’s rulers not opted to declare it an open city and thereby exempt it from bombardment during the Second World War, it might have been reduced to rubble. Islam, in its conservative form, was on constant view, though it was not clear to me why this should be so: Belgium had not had a strong colonial relationship with any country in North Africa. He knew then that difference is never accepted. You are different, okay, but that difference is never seen as containing its own value. Difference as orientalist entertainment is allowed, but difference with its own intrinsic value, no. You can wait forever, and no one will give you that value. There’s always the expectation that the victimized Other is the one that covers the distance, that has the noble ideas; I disagree with this expectation. It’s an expectation that works sometimes, I said, but only if your enemy is not a psychopath. You need an enemy with a capacity for shame. It seemed as if the only way this lure of violence could be avoided was by having no causes, by being magnificently isolated from all loyalties. But was that not an ethical lapse graver than rage itself? It’s a test case of what I believe; people can live together but still keep their own values intact. But I have been disappointed. Europe only looks free. The dream was an apparition. If we try to speak to the Palestinian situation, we hear six million. He had brought me too close to his pain, and I no longer saw him. That doubt that said, these, too, could have killed and killed and only later learned how to look innocent. For people to feel that they alone have suffered, it is very dangerous. Having such a degree of resentment is a recipe for trouble. Our society has made itself open for such people, but when they come in, all you hear is complaints. We’d used up our common ground, and there seemed nothing left to chat about. It has been much too difficult to pass legislation of this kind. Future generations will perhaps wonder what took us so long. I am used to it, but it never ceases to surprise me how easy it is to leave the hybridity of the city, and enter into all-white spaces, the homogeneity of which, as far as I can tell, causes no discomfort to the whites in them. 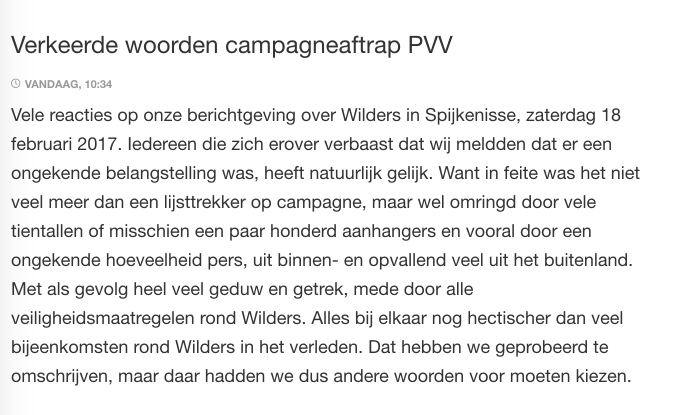 Geert Wilders, leader of the PVV —the far right Dutch Freedom Party— had his campaign start today for the upcoming parliamentary elections in Spijkenisse, one of his traditional strongholds. The eight o’clock news of the NOS (the Netherlands’ state broadcaster) opened with this and their reporter Michiel Breedveld on the scene in the video below said it had attracted ‘an unbelievable crowd of people’. 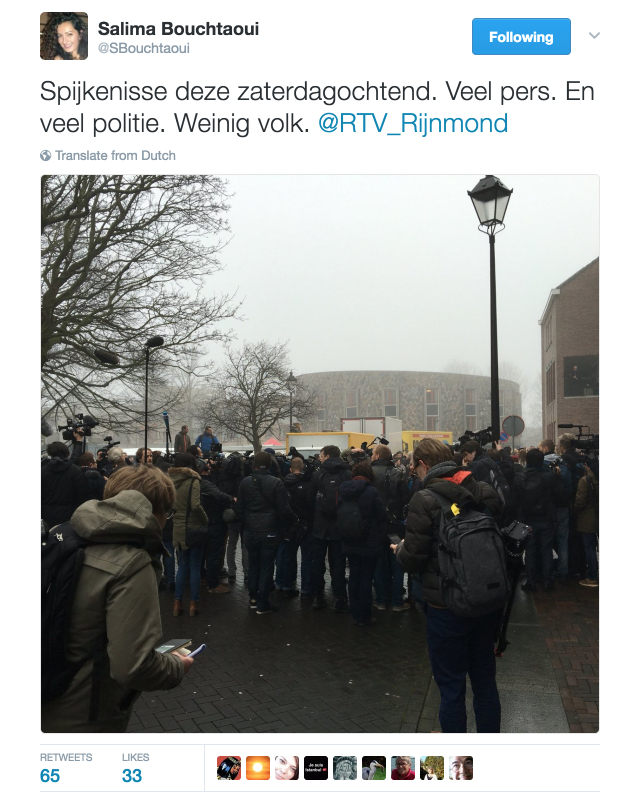 Other reporters who were on the scene today (1, 2) said the number of people Wilders had attracted was somewhere between 80 to 200 and that the ratio of supporters and press was about 1:1. There seems to have been so much press that this was what it looked like most of the time. 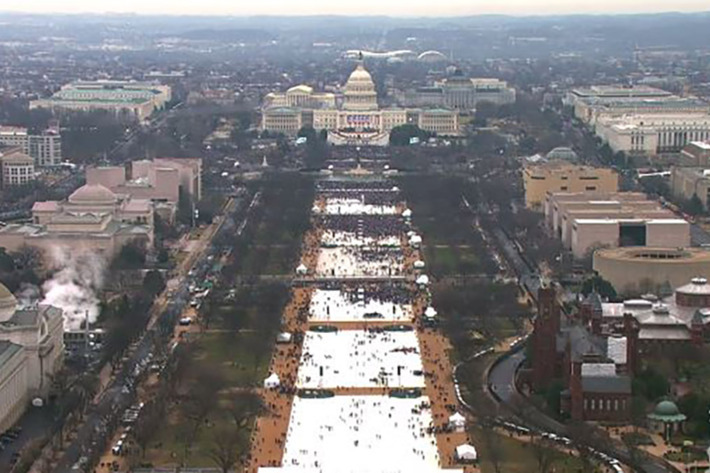 This incident is oddly reminiscent of Trump’s inauguration where the actual number of people present was much lower than was claimed by the administration. But the crucial difference is that Trump was the liar. Wilders could spread the lie that his campaign start ‘had the most people ever’ but why should he if the state broadcaster does it for him? 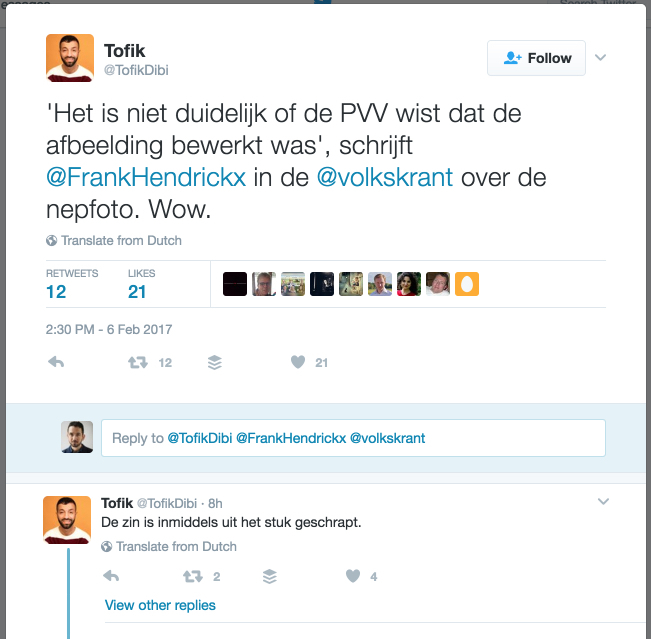 Update: Dutch newspaper the Volkskrant (a newspaper I’ve given some grief before) calls the NOS’s coverage bad and harmful. Update: De NOS have posted a rectification on their single page hard to link they use for this. It’s not the opening of the evening news, but it will have to do. Notably they say they have used ‘wrong words’ to describe the event and they still put the number of supporters at several hundred. 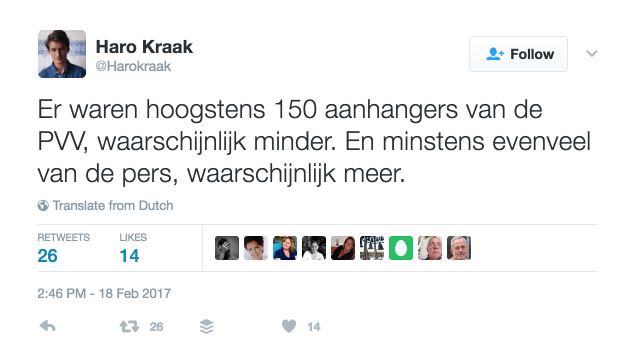 Just another day in the Dutch election campaign. 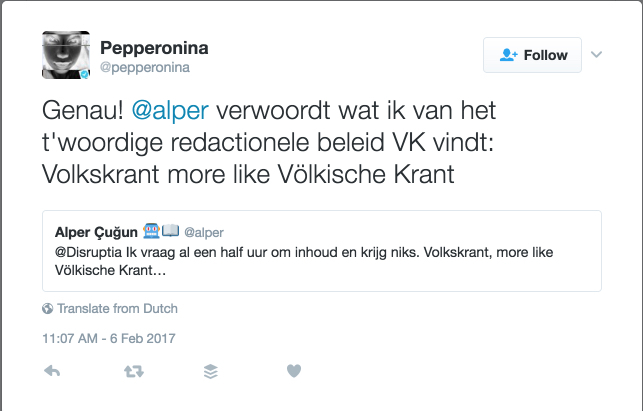 This is in reaction to the statement by Simone Kukenheim, Alderman of Amsterdam, who said Amsterdam would not recognize fascist policies under a possible Wilders government and could look to secede. 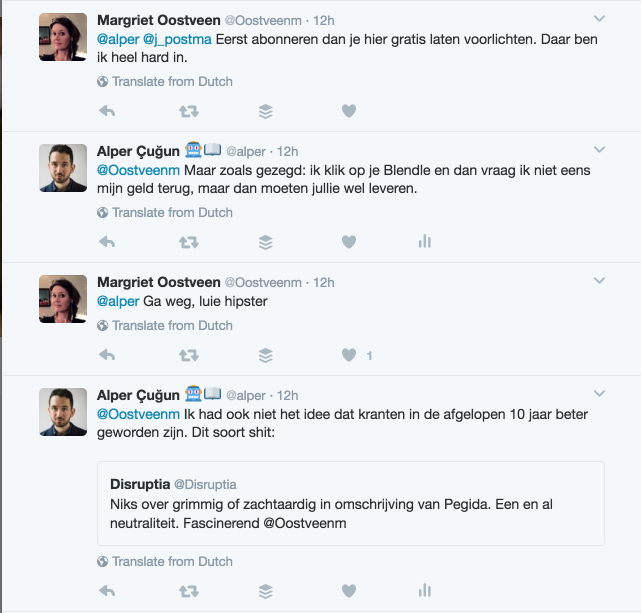 Alexander Pechtold was not amused since he has had to defend himself from death threats caused by these kind of insinuations before. 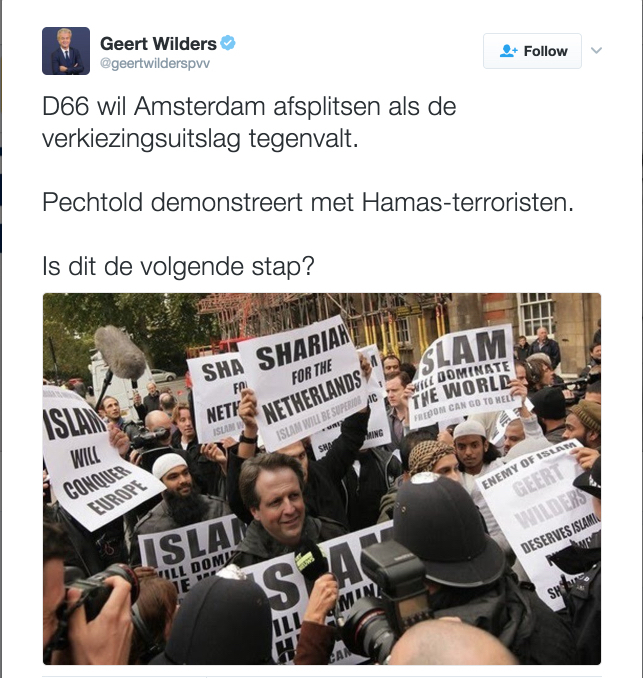 Unlike Wilders Pechtold does not gain that much electorally from having his life put in danger. This seems to have gotten really under Wilders’s skin (I talk a bit about it at the end of Europe Was Left #4), maybe because a sovereignty move from Amsterdam would effectively make him a foreigner again. I inquire whether there is a Dutch newspaper that will do their jobs and take him to task for spreading a false image. Margriet Oostveen posting the original tweet works at the Volkskrant. The Volkskrant is what some people in the Netherlands consider to be a quality newspaper. I don’t get a reply from her but a question back: ‘Which paper are you subscribed to?’ The answer is that I just subscribed to the New York Times. I am actually looking for a Dutch publication right now and can’t find anything suitable. I offer to buy any article of theirs that is critical of Geert Wilders. I am told I am lazy and I should get lost. 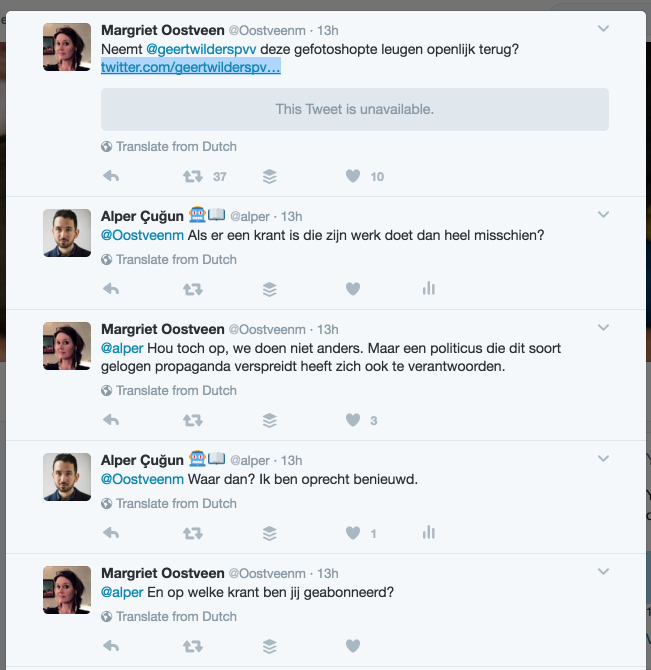 I then remember @Disruptia had pointed out that Margriet Oostveen just wrote a fairly neutral piece about Pegida. The second tweet is him saying that sentence was removed. I found and purchased the piece on their site using Blendle and I couldn’t find that sentence in it. The article isn’t even that bad but that makes it all the more difficult to understand how something that stupid could end up in there. This is one case, the above mentioned nuancing of right-wing extremist group Pegida is another and the list goes on and on. The only thing you could say is that the Volkskrant is not as bad as some other Dutch newspapers. But at this point I don’t have much use for effectively slanted, pretending to be fair and balanced reporting. Finally I said ‘Volkskrant more like Völkische Krant’ which is not fair. I take that back. But they definitely aren’t a Münchener Post either.